The Armenian language ( classical: հայերէն; reformed: հայերեն [hɑjɛˈɾɛn] hayeren) is an Indo-European language spoken primarily by Armenians. It is the official language of Armenia. Historically being spoken throughout the Armenian Highlands, today, Armenian is widely spoken throughout the Armenian diaspora. 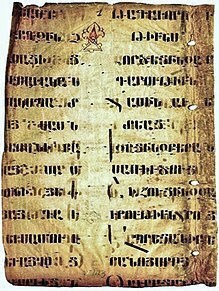 Armenian is written in its own writing system, the Armenian alphabet, introduced in 405 AD by Mesrop Mashtots. W. M. Austin (1942) concluded  that there was an early contact between Armenian and Anatolian languages, based on what he considered common archaisms, such as the lack of a feminine gender and the absence of inherited long vowels. However, unlike shared innovations (or synapomorphies), the common retention of archaisms (or symplesiomorphy) is not considered conclusive evidence of a period of common isolated development. In 1985, Soviet linguist Igor M. Diakonoff noted the presence in Classical Armenian of what he calls a "Caucasian substratum" identified by earlier scholars, consisting of loans from the Kartvelian and Northeast Caucasian languages. Noting that Hurro-Urartian-speaking peoples inhabited the Armenian homeland in the second millennium BC, Diakonov identifies in Armenian a Hurro-Urartian substratum of social, cultural, and animal and plant terms such as ałaxin "slave girl" ( ← Hurr. al(l)a(e)ḫḫenne), cov "sea" ( ← Urart. ṣûǝ "(inland) sea"), ułt "camel" ( ← Hurr. uḷtu), and xnjor "apple(tree)" ( ← Hurr. ḫinzuri). Some of the terms he gives admittedly have an Akkadian or Sumerian provenance, but he suggests they were borrowed through Hurrian or Urartian. 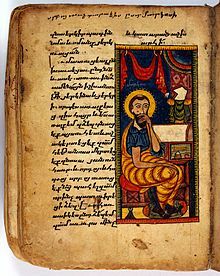 Given that these borrowings do not undergo sound changes characteristic of the development of Armenian from Proto-Indo-European, he dates their borrowing to a time before the written record but after the Proto-Armenian language stage. Loan words from Iranian languages, along with the other ancient accounts such as that of Xenophon above, initially led linguists to erroneously classify Armenian as an Iranian language. Scholars such as Paul de Lagarde and F. Müller believed that the similarities between the two languages meant that Iranian and Armenian were the same language. The distinctness of Armenian was recognized when philologist Heinrich Hübschmann (1875)   used the comparative method to distinguish two layers of Iranian words from the older Armenian vocabulary. He showed that Armenian often had 2 morphemes for the one concept, and the non-Iranian components yielded a consistent PIE pattern distinct from Iranian, and also demonstrated that the inflectional morphology was different from that in Iranian languages. Armenian corresponds with other Indo-European languages in its structure, but it shares distinctive sounds and features of its grammar with neighboring languages of the Caucasus region. Armenian is rich in combinations of consonants. Both classical Armenian and the modern spoken and literary dialects have a complicated system of noun declension, with six or seven noun cases but no gender. In modern Armenian, the use of auxiliary verbs to show tense (comparable to will in "he will go") has generally supplemented the inflected verbs of Classical Armenian. Negative verbs are conjugated differently from positive ones (as in English "he goes" and "he does not go") in many tenses, otherwise adding only the negative չ to the positive conjugation. Grammatically, early forms of Armenian had much in common with classical Greek and Latin, but the modern language, like modern Greek, has undergone many transformations, adding some analytic features. Distinct Western Armenian varieties currently in use include Homshetsi, spoken by the Hemshin people;  the dialects of Armenians of Kessab ( Քեսապի բարբառ), Latakia and Jisr al-Shughur (Syria), Anjar, Lebanon, and Vakıflı, Samandağ (Turkey), part of the "Sueidia" dialect ( Սուէտիայի բարբառ). Nakhichevan-on-Don Armenians speak another Western Armenian variety based on the dialect of Armenians in Crimea, where they came from in order to establish the town and surrounding villages in 1779 ( Նոր Նախիջևանի բարբառ). The Armenian alphabet ( Armenian: Հայոց գրեր, translit. Hayots grer or Armenian: Հայոց այբուբեն, translit. Hayots aybuben) is a graphically unique alphabetical writing system that is used to write the Armenian language. It was introduced around AD 405 by Mesrop Mashtots, an Armenian linguist and ecclesiastical leader, and originally contained 36 letters. Two more letters, օ (o) and ֆ (f), were added in the Middle Ages. During the 1920s orthography reform in Soviet Armenia, a new letter և (capital ԵՎ) was added, which was a ligature before ե+ւ, whereas the letter Ւ ւ was discarded and reintroduced as part of a new letter ՈՒ ու (which was a digraph before). This alphabet and associated orthography is used by most Armenian speakers of the Republic of Armenia and the countries of the former Soviet Union. Neither the alphabet nor the orthography has been adopted by Diaspora Armenians, including Eastern Armenian speakers of Iran and all Western Armenian speakers, who keep using the traditional alphabet and spelling. ծունկ cunk  "knee" knee ( ← OE cnēo) genū "knee" زانو zɒnu "knee" γόνυ gonu "knee" जानु jānu "knee" glún "knee" *ǵénu- "knee"
տարի tari "year" year ( ← OE gēar) hōrnus "of this year" یاره، سال jɒre, sɒl  "year" ὥρα hōra "time, year" यरे yare  "year" яра jara "springtime" (archaic) *yeH₁r- "year"
գործ gorc  "work " work ( ← OE weorc) urgēre "push, drive" کار kɒr "work" ἔργον ergon "work" वर्चस् varcas "activity" *werǵ- "to work"
մեծ mec  "great " much ( ← OE mycel "great, big, many") magnus "great" مه، مهست meh, mæhest "great, large" μέγας megas "great, large" महति mahati "great" много mnogo "many" maige "great, mighty" *meǵ- "great"
անծանոթ ancanotʿ  "stranger, unfamiliar" unknown  ( ← OE uncnawen) ignōtus  "unknown" ἄγνωστος agnōstos  "unknown" अज्ञात ajñāta  "unfamiliar" незнакомый neznakomyj *n- + *ǵneH₃- "not" + "to know"
^ Austin, William M. (January–March 1942). "Is Armenian an Anatolian Language?". Language. Linguistic Society of America. 18 (1): 22–25. doi: 10.2307/409074. JSTOR 409074. ^ Diakonoff, I. M. (1985). 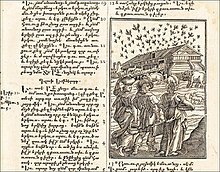 "Hurro-Urartian Borrowings in Old Armenian". Journal of the American Oriental Society. New Haven. 105 (4): 597–603. doi: 10.2307/602722. ISSN 0003-0279. JSTOR 602722. OCLC 6015257905.